About Mamaroneck, NY – Happy to be your hometown Heating & Air Conditioning Contractor! The town of Mamaroneck, another shoreline community in Westchester County, consists of the villages of Larchmont and Mamaroneck. With a population hovering around 30,000, the town is home to several distinct neighborhoods including Shore Acres, Greenhaven and Orienta. Each of these was previously owned by wealthy New York city families who once summered here. 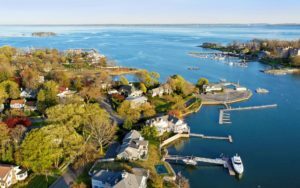 Incorporated in 1895 and first purchased from Native American inhabitants by an Englishman named John Richbell in 1661, Mamaroneck has steadily evolved into the vibrant residential and commercial community you see today. The railroad first came through the Village in 1848 servicing riders from New York City to Connecticut and is now the New Haven line of MetroNorth. Mamaroneck boasts a who’s who list of famous people who either now or once called our community home, including Lou Gehrig, Matt Dillon, James Fenimore Cooper, Norman Rockwell, and the renowned silent film director D.W. Griffith. Life is filled with interruptions, both major and minor. Not to mention positive and negative. How would you rate having your furnace shut down? Talk about an interruption, especially if it occurs in the middle of the night in mid-January or so. That’s one that requires prompt and decisive action, which is precisely what you can expect from APA. If you want to avoid an interruption of service from your air conditioning system, then contact Air Professionals now to schedule our preventative maintenance service, especially if it’s been at least a year since service was last provided. Preventative maintenance also will help your system run better, longer, and more affordably. For the ultimate in annual energy savings, ask us about an air source or ground source heat pump: one system that combines reliable and high efficiency home heating and cooling.